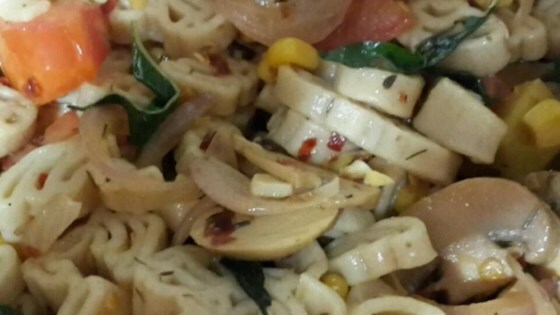 "This is a fiery but quick and easy to make pasta dish. For a milder flavor, simply leave out the chiles." Meanwhile, heat oil in a saucepan over medium heat. Saute garlic with basil and Italian seasoning for 2 to 3 minutes. Stir in onion and chiles; cook until onion is tender. Stir in tomatoes and hot sauce; simmer for 5 minutes, or until heated through. Toss with the cooked pasta, and season with salt and pepper. I make a version of this at home; but I just use a can of Rotel (tomatoes and chili peppers) to decrease a step. This is so yummy and spicy!! I used Valentinas hot sauce. I liked a lot. Dominic didn't try it. I really enjoyed this dish. It was even better as leftovers.